Wow. I thought I loved snickerdoodles before I made these cookies, but I had no idea that I could love them even more stuffed with gooey caramel! Cinnamon and caramel are so unexpectedly delicious together, and I love the combination of textures between the soft cookie and the luscious caramel. Best of all, they're quick and easy to make with storebought caramels! 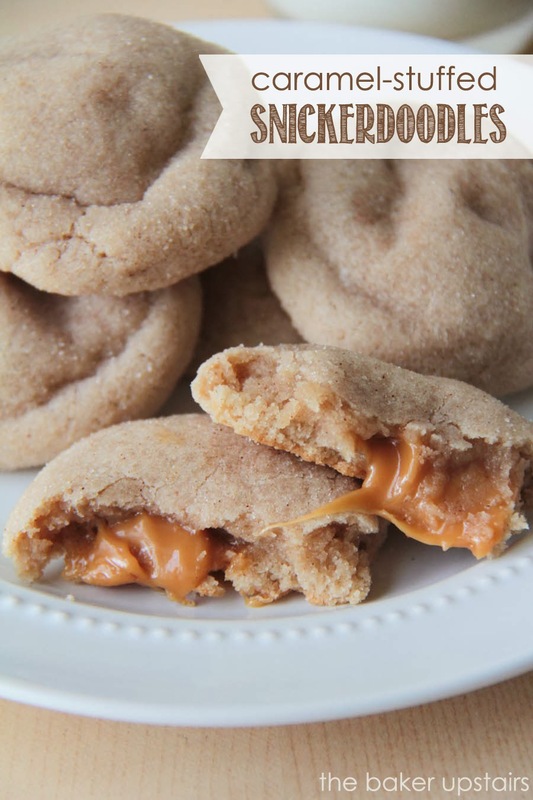 These cookies are best warm (and we could hardly wait long enough for the caramel to cool before we shoved them in our mouths) but if you're eating them the next day, popping them in the microwave for a few seconds works great to soften up the caramel again. Yum! Preheat oven to 375. In a large bowl or the bowl of a stand mixer, cream butter and 1 cup sugar together. Beat in egg and vanilla until blended. Add flour, salt, baking powder, and 1 1/2 teaspoons cinnamon, and stir to form a dough. If the dough is too thick and crumbly, add milk to soften it up a little. Whisk together 1/4 cup sugar and 1 tablespoon cinnamon. Divide dough into 18 equally sized balls. Flatten each ball with your palm and press a caramel into the middle. Wrap the dough around it to cover the caramel completely and form a ball again. Roll ball in cinnamon sugar mixture and place on a lightly greased baking sheet. Press down gently to flatten dough just a little. Bake 10-12 minutes. 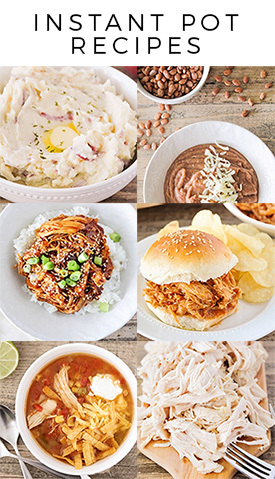 My mouth waters as I read this recipe! A must try! 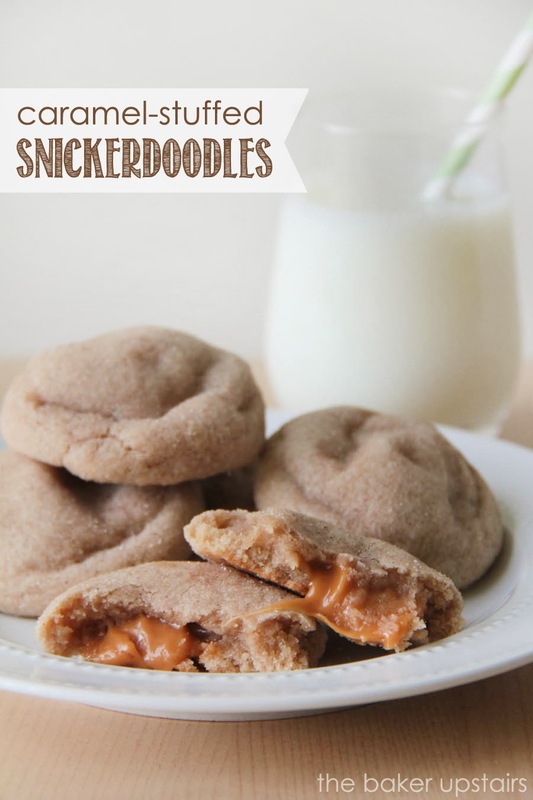 I recently made snickerdoodles with caramel and I too was surprised how well they go together!! l bet you're cookies are delish!! The flavor is amazing but almost all of them blew up when cooking. The caramel ran out the sides. They still tasted great, just didn't look very pretty. I made this for thanksgiving and loved the taste but not the hard caramel. I decided to tweak it after a few failed attempts I master it. First I melted the caramels and added 1 tablespoon of heavy whipping cream. I let that cool in the refrigerator over night. This made the caramels much more creamy and soft in the cookies. I chilled the cookie dough for a little bit also. While rolling the cookies I tried to make the caramels small as possible and wrap them completely, sealing the seams. They turned out perfect. Won the cookie competition and the cookie exchange. Made these cookies yesterday and they came out beautifully. I think the key is making the dough balls big enough to fully encapsulate the caramels so they don't run out when cooking. I also used baking soda instead of powder (bc I didn't feel like running to the store), and again, they came out beautifully. Thanks for the recipe! Can't wait to share them at Christmas.